Posted January 7th, 2017 by Mike Boyes & filed under Abnormal Psychology, Adult Development and Aging, Aging Psychological Disorders, Aging-Psychological Disorders, Depression, Health and Prevention In Aging, Health Psychology, Intervention: Adults-Couples, Neuroscience, Research Methods, Stress Coping - Health. Description: How might playing a tablet based game have a positive impact upon symptoms of late-life (post 60 years) depression? Before you read the article linked below think about the symptoms that are typically associated with depression. In addition to mood related issues (obviously associated with depression) what sorts of cognitive factors are associated with depression? Amongst those over 60 who are dealing with depression these can include difficulty focusing on personal goals and on concentrating due to distraction from one’s worries. What if a game was not intended to focus directly on the mood aspects of depression but, instead, focused upon the cognitive symptoms just noted? Do you think that might help? Have a look at the article linked below and see what the researchers have found. Source: Gaming your brain to treat depression. Science Daily, Science News. Psychological researchers and clinicians have been developing a deeper and deeper understanding of the very broad array of ways in which depression influences our mental processes. There is increasing evidence that focusing upon changing the mental (cognitive) functioning of people dealing with depression in one or some of these diverse areas can help to alleviate their symptoms of depression. Cognitive Behavioural Therapy, for example, challenges the self-defeating thoughts or hopeless beliefs associated with depression and not only seems to alleviate the symptoms of depression but also to shift the levels of neurotransmitters involved in regulating mood and other aspects of depressive symptoms. 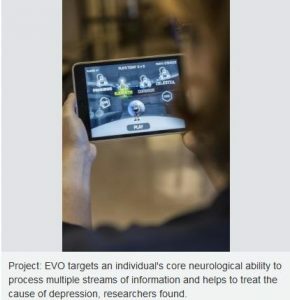 So, the tablet game that boosts attention and distraction movement used by the researchers seemed to help moderately depressed participants over 60 by reducing their overall pattern of depressive symptoms. As well, the game was clearly engaging with most participants playing the game more frequently that was requested by the researchers. The Project: EVO software is one of what will undoubtedly be a fast increasing array of software products aimed at encouraging positive changes in neurological functioning associated with an array of mental functions. Research into the importance of the bi-directional nature of the relationship between cognition/brain function and general health and wellness is going to be worth following closely over the next few years. How are things like attention and distraction management related to things like depression? How do the games that were used in the research discussed in the linked article related to changes in the symptom patterns associated with depression? How might the finding of this research change for physicians, psychologist and psychiatrists approach their clients an patients who present with symptoms of depression or other disorders?